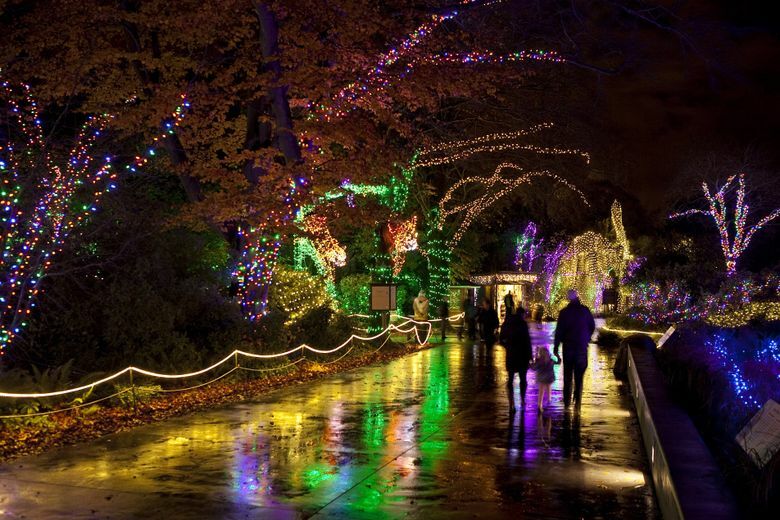 Woodland Park Zoo WildLights through Jan. 3; Bellevue Botanical Garden Garden d’Lights through Jan. 2; Point Defiance Zoo and Aquarium Zoolights through Jan. 3, 2016; Christmas Ships Festival through Dec. 23, 2015. As winter solstice approaches and the days grow shorter, holiday lights brighten long winter evenings at Woodland Park Zoo’s WildLights, Bellevue Botanical Garden’s Garden d‘Lights and Point Defiance Zoo & Aquarium Zoolights. Wild animals and wild places made of 600,000 lights fill zoo pathways and the North Meadow at WildLights, with carousel rides, faux-snow for snowball fights and snow creatures in the Snowmazium, caroling, shopping in the ZooStore, food vendors and a new Holiday Beer and Wine Garden. Most zoo animals are tucked in for the night, but the indoor reptile and amphibian exhibit, meerkats, a few other nocturnal animals and a pair of guest reindeer are on display. Santa stops by every Friday through Sunday until Christmas and Dec. 21 through 23. WildLights is open daily through Jan. 3 (closed Dec. 24-25), with free parking in zoo lots. Bellevue Botanical Garden blossoms into a garden-themed wonderland of fanciful light sculptures at Garden d’Lights, with an array of displays including Charlotte in her web among new features and old favorites. New visitor-services buildings offer amenities including the Trillium Store and accessible restrooms. The display has changed and grown this year along gravel surfaced trails, with much of it visible from a fully accessible patio. Garden d’Lights is open every evening through Jan. 2, including holidays. Zoolights at the Point Defiance Zoo & Aquarium brightens nights with new and favorite traditional animal light sculptures including a 22-foot-wide crab with moving pincers, a polar-bear family and a giant Pacific octopus. The carousel and South Pacific Aquarium are open, along with camel rides, the cafe, some animal displays and, on select days, Santa diving with Aquarium sharks. Zoolights is open nightly through Jan. 3 (closed Dec. 24). Combo passes that include a day at the Zoo are available. The Argosy Cruises Christmas Ship Festival’s lighted boats visit waterfront communities around Puget Sound through Dec. 23, a local holiday tradition since 1949. Other lighted boats often join the boat parade that makes 20-minute stops for choir performances at several locations daily; rides on the lead and follow boats are available by reservation.